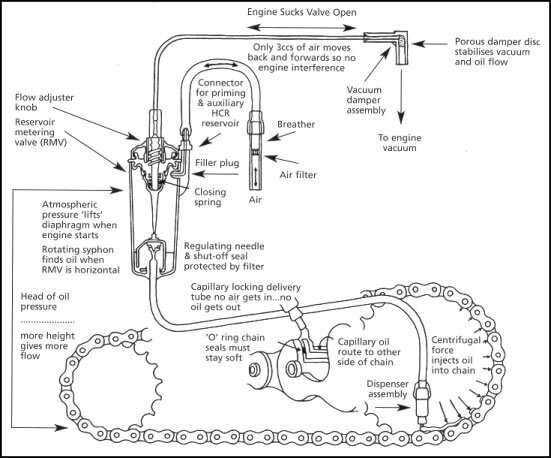 A Scottoiler is a small chamber (5 inches long) that connects into the vacuum between the carburetor and engine and when the engine is running slowly drips chain oil onto your chain. Fitting a Scottoiler can give you an increase in chain life of up to 7 times the norm, It’s supplied as a universal kit that fits most bikes, including fuel injected models and does not affect engine performance, It is high quality, tried and tested design developed over 20 years. The standard chamber holds enough oil for about 400 miles (depending on the flow rate) if that isn’t enough for you, Scottoiler produce a high capacity add-on that fits behind the number plate and hold’s about 1000-1500 miles worth of oil. On our recent trip around Europe, only one person in the group didn’t have one fitted, and he spent 10 – 20 minutes at the end of every day, oiling and adjusting his chain, and by the end of the trip (3000 miles later) his chain was so stretched it needed to be replaced once back in the UK. If you could only buy one thing for your bike, this is it – Honest! No more messy chain lube, messing about with paddock stands or getting your mate to hold the bike. A few dealers that we have spoken to have said “Oh you can not fit a Scottoiler to that bike, if it’s got fuel injection”, but this is not so, you can fit one to 595’s, 955’s, VFR800i’s etc. Just contact Scottoiler or visit there website, and they list a wide range of fitting instructions. I’ve had my current Scottoiler now for over 2 and 1/2 years and I’m as happy with it as the day it was first fitted. I’ve done over 16K miles on the Triumph and the chain has only required adjusting half a dozen times all due to the Scottoiler keeping the chain correctly lubricated. While updating parts of RigsVille I thought I would update this item, I’ve updated my universal Scottoiler to the touring version and everything is still going strong. I have had to replace the chain and sprockets on my bike, but I did get over 25K miles before they needed replacing, now I’m currently at 35K miles and I’ve only ever needed to adjust the chain a handful of times. Extremely robust – no wearing parts. 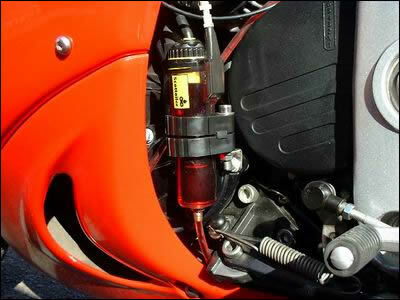 Valve unit can be mounted anywhere on bike, (even works on it’s side). 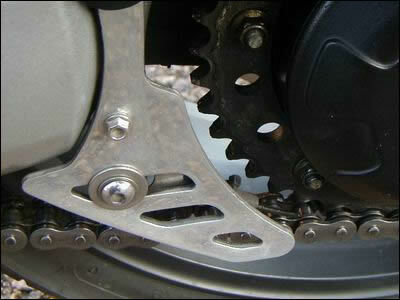 Oil collects near the gearbox sprocket and can drip. 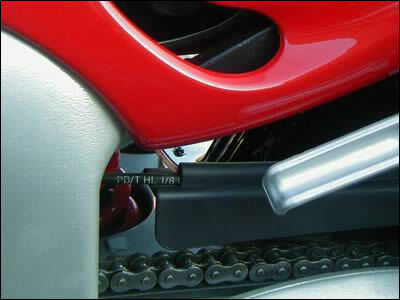 Available direct from www.scottoiler.com and most motorcycle dealers.